Several readers have emailed me inquiring about dog ramps. Boat owners love their pets as much as anyone and want to be able to take them along on their boat. That can be a hardship for the dog, depending on the design and layout of the boat. High freeboard, as well as narrow and steep boarding ladders, makes it difficult or impossible for larger dogs to safely board a boat. A properly sized and installed dog ramp can ease Rover’s boarding dilemma. These ramps can be divided into several categories: folding, telescoping, fixed and D-I-Y. A further defining characteristic whether or not the ramp can be used with one end in the water, thus aiding in getting a swimming dog aboard. A quick Google search of the Internet brought up a number of dog ramp manufacturers. Not all were suitable for use aboard a boat, however. Some primary criteria for a marine dog ramp are the ability to attach the upper end to the boat, an appropriate non-skid surface for secure footing and whether the materials are suitable for the marine environment. A secondary consideration is the ability to store the unit aboard. A great final characteristic is whether the unit is strong enough to support a boarding human (many are). The two most important considerations when using a ramp to board a dog from the water are the angle of the ramp and the depth of the end of the ramp. The angle of the ramp should be about 15 degrees or so. The intent is to mimic the angle of a beach not a steep cliff. Think about how tired you are after spending time swimming in the water. Your dog will feel the same way. The end of the ramp should be far enough under the water so your dog can step on the end instead of having to climb on the end of the ramp. Another solution to the dog boarding problem is the use of a “Passarel”. In Europe many boats tie off to the docks bow or stern in, called “Med mooring”. Many of these boats are equipped with passarels, usually from the stern to the dock or quay. These are really high end boarding ramps, many times hydraulically or electrically stowed and deployed. These are becoming more and more popular on high end boats on this side of the pond. Since they are strong enough for humans, the dogs will do fine. This is one of the more popular designs and is available at many marine stores, such as West Marine or Boater’s World. It is constructed of a glass fiber filled polypropylene plastic, provided good strength combined with corrosion resistance. The surface of the ramp is both ribbed and coated with a rubber like material. Both features together provide a non slip surface for best traction for your dog. The ramp is stowed by folding in half. Extended the ramp is 17 inches wide and 60 inches long. The ramp itself will not sink. If you plan on using the ramp for boarding from the water, optional flotation devices are available to support the weight of the dog. While the ramp weighs only eighteen and a half pounds, it will support 500 pounds. This unit is designed to attach to a boat’s stainless steel stern boarding ladder. A combination of support arms and Velcro straps quickly attach the unit to the ladder. Additional adjustable support braces allow the ramp to be configured at the right slope for easy boarding. A movable floatation block aids in positioning and supporting the ladder. It can be quickly moved aside when a human wants to use the boarding ladder. The ladder itself is 32 inches long folded and just over 63 inches extended. The ramp is 16 inches wide, ample for even large dogs. The 18 lb. ramp is designed to support dogs weighing up to 130 lbs. and is constructed from corrosion proof and UV resistant plastic and stainless steel. These folks manufacture three different models and an extension kit. While primarily for docks, the units can also be mounted on a boat. The ramps are all 20 inches wide and come in non-folding, folding and jumbo designs. Capacities range from 70 lbs. to 120 lbs, depending on which design you choose. Weights range from 28 to 30 lbs. and are made from stainless steel components and marine materials. The surface of the ramp is covered with marine grade carpet that is mildew, UV and fade resistant. While these units are not specifically designed for boats, their design and pricing make them good candidates. Five different models come in both telescoping and non-telescoping designs. The non-telescoping design spans 42 inches while the telescoping models span from 70 to 84 inches. Weights range from 7 to 22 lbs. Construction is from riveted aluminum and marine polymer. The surface of the ramp is covered with indoor/outdoor carpeting for traction. The maximum weight limit on all models is 300 lbs. All the ramps discussed above are warranted for pet use only; humans using them void the warranties. In contrast, a passarel from Deck to Dock is designed for human use and so will accommodate pets. Passarels, most often just called boarding ramps in the U.S., are usually deployed from the stern. Top of the line models retract into stern housings electrically or hydraulically. They can be equipped with handrails to aid human users. 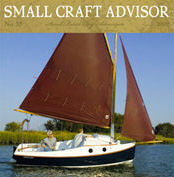 These units are most often installed as part of the original equipping of the boat or added by professional installers. Prime advantages are ease of stowage and high weight capacity in a multipurpose package – as opposed to a single purpose dog ramp. As always, the handy boater has the ability to put together their own interpretation of a dog ramp. In fact, some of the non-boat style ramps will require some D-I-Y activity to match the ramp to the boat. One possible scenario is to use a section of an aluminum extension ladder as the frame work for a dog ramp. The ladder can be cut to the required length and a flat surface can be screwed to the ladder rungs between the uprights. That surface could be marine plywood or a polymer material such as StarBoard ™. Be sure to seal the surfaces with epoxy if plywood is chosen. The surface can then be covered with outdoor marine carpeting for a good grip. Alternately, narrow strips or cleats can be fastened across the surface of the ramp for better grip. Two small fenders tied to either side of the end of the ladder section can provide floatation for the end of the ramp. Be careful not to over-build or you’ll end up with a ramp that is too heavy to conveniently use and store. The discussion so far has revolved around getting the pet from the water or the dock into the boat. On some boats with low swim platforms and high transoms, getting the dog onto the swim platform is only half the battle. A second ramp, angled from the swim platform across the back of the transom to the top of the transom or rear boarding door might be necessary.